On our way from Bali to Cambodia we had about a 12 hour layover overnight in the Singapore airport. A short amount of research led us to believe that there are few better airports to have to spend time in! The Singapore airport is like a mall and resort (and airport) all in one. There are free movie theaters, free video games, free internet. There are gardens, indoor and out, fitness centers, and even a pool. There are also free foot massage chairs all over! There are also some very nice transit hotels. We thought about paying for a bed during our overnight stay, but it just seemed too pricey so we decided to go the old fashioned route and just find some chairs to sleep in. We were in luck there too, because Singapore airport has some of the nice sleeper chairs. We arrived late into Terminal 1. We walked by one small area with sleeper chairs, but there were only two left and they were not close to each other so we passed it up, sure we would find something else. We headed into the main Terminal 1 area and found a sign that pointed to a “rest area” on the second floor near some restaurants. We headed that way, but it was full! We were starting to worry that we would end up having to sleep on the floor or across some bench seats just like at any other airport. Boo. We decided to keep looking and walked all the way to Terminal 2 where we saw a sign for the Oasis lounge. We headed that way, and were in luck! Two sleeper chairs right next to each other in a quiet area that was darkened. Perfect. We actually got amazing sleep for being in an airport and 6ish hours later, we woke semi-refreshed. The only issue had been feeling cold overnight (why are airports always so cold?? ), but we had both remembered some layers to keep ourselves warm. We also ate breakfast at one of the great food courts in the the airport. 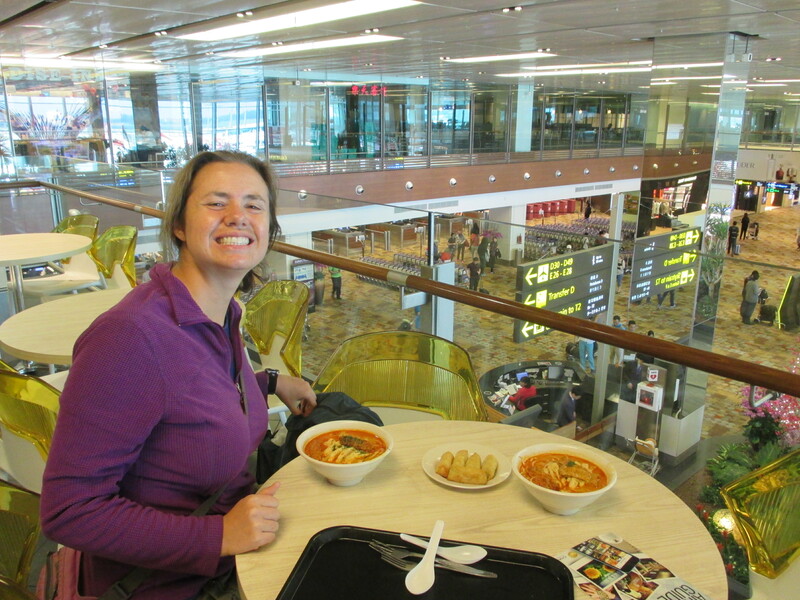 It had a variety of Asian food and we were excited to have another bowl of Singapore Laksa before our time there came to a close. We were slightly disappointed that we didn’t get to take advantage of all the other awesome things that the airport had to offer! I guess, we’ll have to hope for another long layover there in the future!